CAPE GIRARDEAU, Mo. 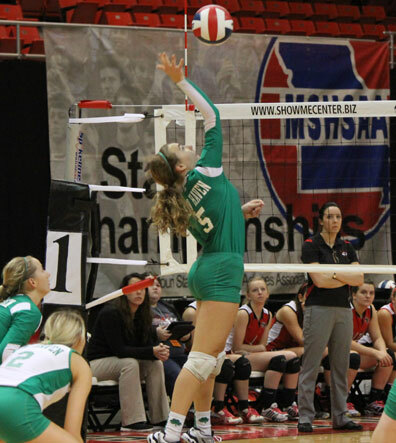 - The outcome of this weekend’s Class 1 Volleyball State Finals was not what the Lady Shamrocks had hoped for after a three set loss to Santa Fe (25-19, 17-25, 22-25) in Saturday’s Third Place State Match. After Saturday’s match Coach Jaime Hoener had a lot of positive things to say about this year’s team. Emma Borcherding recorded a career high 11 kills in Saturday’s Third Place Game. In Friday’s pool play New Haven got off to a rough start losing both sets in their first match against St. Vincent (25-18,25-18) which later would be the difference in whether New Haven would have been play for a State Title. The Shamrocks would end up fighting their way back in their second match take both sets against Santa Fe (25-21,25-23). While New Haven had improved to 2-2 after two games, Winona and St. Vincent split sets, leaving both teams 3-1 after two games. 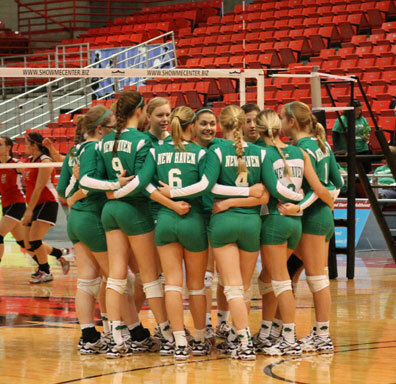 Despite New Haven’s slow start they entered their final match against Winona and control of their own destiny. If New Haven had won both sets over Winona they were guaranteed the second seed, putting the Shamrocks in the State Championship match. After Winona took the first set 25-15, New Haven came back in the second to win 25-19. Even though St. Vincent lost both sets to Santa Fe, leaving New Haven and St. Vincent tied in pool play with records of 3-3, it would be St. Vincent playing for a State Title since they had beaten the Shamrocks head-to-head in the first game on Friday. Even with a disappointing fourth place finish, New Haven’s overall season was one of the best in school history. They won more games than any other team, finishing with a record of 32-7-1 and won the Four Rivers Conference going a perfect 7-0, while not losing a single set. They also finished second place in the Hermann Tournament and it was the first time since 1992 that New Haven had last played for first. In the Class 1 State Championship on Saturday Winona won their third straight State Championship defeating St. Vincent in three sets after losing the first set 25-22, but went on to win 25-13 and 25-20.